The review of Chapter 1 verses continues with quiz questions part 4. Chapter 1 addresses what to abandon and what to practice to attain upper rebirth and highest good. Part of a series of talks on Nagarjuna’s Precious Garland of Advice for a King. Venerable Tenzin Tsepal was first introduced to meditation in high school in the 1970s. While working as a dental hygienist in Seattle and hospital administration in Yakima, she practiced and attended retreats in the Vipassana tradition. In 1995, she found Dharma Friendship Foundation and teachings with Venerable Thubten Chodron. She attended the Life As A Western Buddhist Nun conference in India as a lay volunteer in 1996. Following a life-changing 3-month Vajrasattva retreat in 1998, Ven. Tsepal lived in Dharmsala, India for two years where she further explored the idea of monastic life. She received novice ordination as a Buddhist nun with His Holiness the Dalai Lama in March of 2001. After ordination, she was immersed in the full-time residential Buddhist Studies Program at Chenrezig Institute in Queensland, Australia, principally with Khensur Rinpoche and Geshe Tashi Tsering. As a qualified FPMT teacher, Ven. Tsepal was appointed the Western Teacher at Chenrezig Institute from 2004 to 2014, teaching the Discovering Buddhism series, tutoring for the general program and leading retreats. 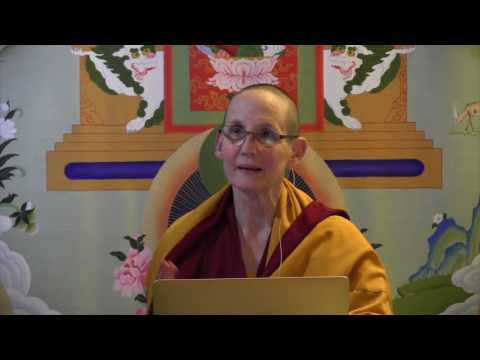 In 2015, she tutored three subjects for the FPMT Basic Program. Venerable Tsepal arrived at Sravasti Abbey in mid-January for the 2016 Winter Retreat. She joined the community in September 2016, and received Shiksamana training that October.